US Supreme Court DENIES application to vacate stay in StopNDAA lawsuit. 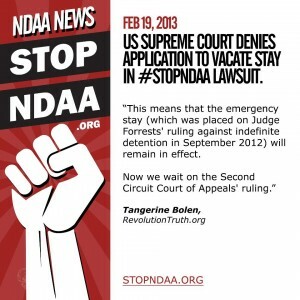 | Stop the NDAA! This means that the emergency stay which was placed on Judged Forrests’ injunction against Section 1021 and indefinite detention will remain in effect. Now we wait on the Second Circuit Court of Appeals’ ruling. Our attorneys asked the Supreme Court to consider lifting the “stay” on our injunction against Section 1021 and indefinite detention. As you’ll recall, we won our lawsuit last September and were granted a worldwide injunction against this provision – ensuring people could not be indefinitely detained under the sweeping and unchecked scope of the NDAA. Despite having issued a signing statement in January of 2012 claiming he would not use these powers against American citizens, Obama immediately appealed Judge Forrest’s ruling and our win, then went further and asked her to grant a stay on the injunction, essentially “lifting” that injunction. She refused. Next, the DOJ attorneys went to the second circuit court and asked them to lift the stay as well, claiming “irreparable harm” would be incurred by the US if the government did not have these unchecked powers. The second circuit court judges granted their request and put a stay on our injunction. We applied to both Justice Ginsberg (who said no) and Justice Scalia (who said yes) to convene a conference of the entire Supreme Court to consider lifting that stay and restoring our injunction. They told us yesterday that they will not lift the stay – indefinite detention under the NDAA stands. Now, it is up to us to convince the media in time to cover the TRUTH about the AUMF and the NDAA and what the United States government has been doing, and why they needed to conflate these two laws, and why they think they are allowed to have unchecked powers to detain anyone, anywhere based on suspicion alone. Have you attempted to get interviewed by Sean Hannity, Mark Levin, Phil Valentine, etc? Talk radio is the only media that will allow the truth. But isn’t this what the Democrats complained about with Bush – indefinite detention of those taken in battle. Do they believe what they say? These don’t even have to be taken in battle against American forces?? And they want to disarm the law abiding, honest American people. Is everyone seeing the plan of bloody destruction, enslavement, murder and tyranny that is being formed by the secret servants of Satan, the globalist organized crime syndicate? For hope, see: youtube.com/watch?v=hlfYHAV1i8w PLEASE watch the entire 1 hour and 44 minute video to get the broader picture of what is happening on planet earth. We are on the verge of seeing America turned into a vicious, totalitarian, far-left police state. And it is the sort of people who frequent websites like this, i.e., conservative Americans who still want us to be a free, constitutional republic, who will be the first victims of this. Wake up and RESIST, before it’s too late! All they have to do is declare you a senior member of a terrorist organization and then can legally kill an american citizen on american soil without due process. Some people think that sounds ok. But for example they could have declared dorner a senor member of a terrorist organization, his own (1 member), send in the drones and kill him. But I guess letting the san bernardino sheriff set the building on fire worked just as well in this case.